I'll be the first one to say that I missed participating in my family's traditional Sunday morning bagel gathering with my in-laws when I began eating low-carb/keto. 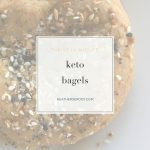 So I developed a keto bagels recipe that is a wonderfully delicious substitute with just 3 grams of carbohydrate per bagel. You really can maintain your keto lifestyle and enjoy your bagels, too! I experimented with the basic fathead pizza dough recipe in order to recreate this recipe because I have always found that low-carb dough to be the closest in taste and texture to traditionally made dough. 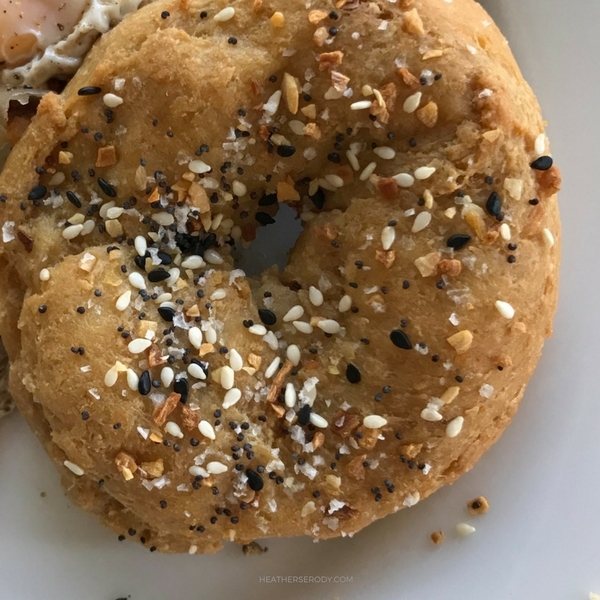 I think the best bagels are dense and dough-like, so I knew that a variation of fathead dough would do it, so I experimented. I also always try to reduce my reliance on almond flour because the carbs in almond flour quickly add up. The solution was to reduce the almond flour and combine it with pork rind breadcrumbs and grated parmesan cheese which adds a savory flavor and depth while imparting a chewy texture to the baked dough. In a medium sized glass bowl, whisk together the alond flour, pork breadcrumbs, grated parmesan, and baking powder until well-combined. Pour the flour mixture to the bowl of a food processor fitted with the steel blade. Turn the dough out onto a clean surface and shape into a rounded cube shape. Halve the dough with a knife and then cut each half into thirds so you have 6 pieces of dough of roughly the same size. Working quickly while the dough is still warm and re-oiling your hands if necessary, shape the dough into about a 6" cylinder and then press the ends together forming a bagel shape. Place your bagel on the parchment lined baking pan. Add optional topping of choice, lightly pressing it into the top of the bagel so it sticks. Place in oven and cook 10-15 minutes, or until the bagels are golden and cooked through.